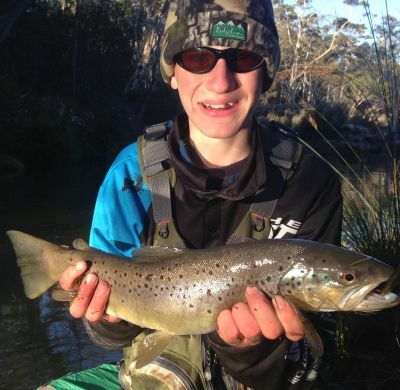 In Tasmania, trout have found their way into just about every trickle of water around the state. Many of these are very small tributaries of larger more popular rivers. The majority of the fish in these smaller streams are by no means monsters, with the average fish being somewhere between half a pound and a pound. Small brown trout dominate most of these small streams with the exception of a few rainbow only waters that are isolated from the dominant brown trout population. ?The upper Mersey River between Lake Meston and Junction Lake is a classic example of this with its huge impassable waterfalls preventing any further migration of brown trout up stream. The highlight of any season usually revolves around the best days sight fishing. Memories of the hunt, approach, cast and hook set will remain in your mind long after those of another ‘flogged up’ have gone. The main prerequisite for this style of fishing are sunshine and cloudless days – two things that should become more plentiful from now until the end of the season. Good polaroiding water is not hard to find but some places are easier than others in which to find fish while others are simply better. Too windy, not windy enough, wrong wind direction. Too bright, too dull, too wet, too dry: excuses—or are they? Farmers and fishing guides have two things in common: firstly, they’re both in the weather everyday, working with Mother Nature. Secondly, both groups will tell you that the animals in their lives all react differently according to subtleties and vagaries of wind direction, atmospheric pressure and lunar cycles. 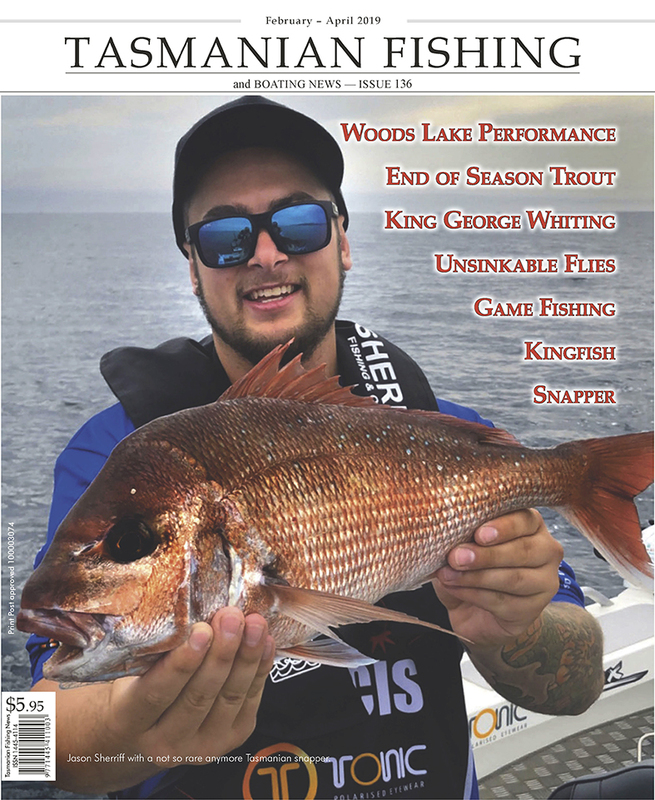 In the case of fishing guides and experienced anglers, you can add a list of hatch and water level factors to the nuances of Mother Nature, vagaries which become plausible excuses at the end of a tough day. After the question of weather patterns and their affects on fishing came up on the FlyLife internet forum, I thought it might be a good time to do a bit of myth-busting with the aid of my fishing diary. The surface is just about the most fun you can have as an angler. 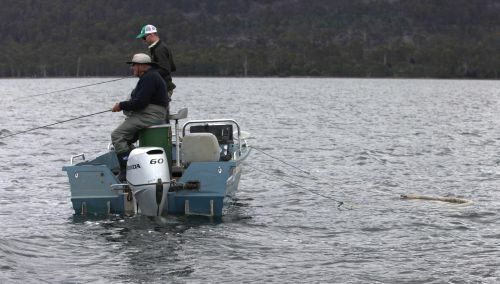 Whether chasing giant trevally in the coral sea, bream in the estuaries, or dry flying trout here in Tassie you can’t help but get excited watching something come up and slurp or smash your top-water offering. Although they have been around for many years, surface hardbodies for trout have never really hit a spotlight but with the new methods and gear being developed at the moment it’s only a matter of time before people begin to look more seriously at top-water options. It takes some time to perfect your technique but it is essentially easy to get started and can be a very effective tool in your trout fishing arsenal. There is no better sight in fly-fishing than seeing your dry fly taken off the surface. 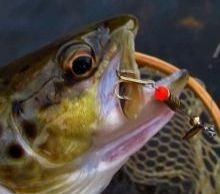 Seeing a fish rise up from the depths, then its mouth close over the fly is truly magical. But we don’t live in a perfect world. Sometimes other methods have to be used to fool our target species. When conditions are bleak and cold, early or late in the season, then sometimes we have to resort to blind fishing big wet flies. Some fisherman like to refer to it as blind flogging, but I don’t think that gives enough credit to it, so we will stick to blind fishing. Yes it is cold—some even think miserable, but wow, the fishing can be fantastic. After three months of winter and very little fishing, the beginning of August is the traditional start of the fishing season. Many people leave it until the central highlands warm up before venturing ‘up top’ but by waiting that long, you could be missing out. After rising at 6:00 am to go for a morning fish, all I could hear was wind and rain, but that didn’t stop me from going. I left at 7:00 am and walked to the lake. There was weed on top of the lake everywhere so it was making it hard to get casts in without getting weed on the lure. I fished for 2 hours more without a hit so I decided to head home for a warm up and some breakfast. But I wasn’t going to give up, so at 1:30 pm Samuel and I went for a fish at one of our favourite spots. Time was going by with only seeing 1 fish and no hook ups, I was starting to doubt if I was going to get any until I saw a little shadow behind my lure. Next I felt a little tap so I striked and hooked a little brown 1.5 pound and 40cm long. I was happy because it was the first trout for the season. Read more: Great success Saturday!